The European Union and the North Atlantic Alliance intend to strengthen cooperation. The EU and NATO are cooperating more actively than ever before, and over the last three months a greater number of agreements have been reached than in the previous 13 years, the head of EU diplomacy Federica Mogherini said at a joint press conference with NATO Secretary General Jens Stoltenberg in Brussels. Mogherini said the cooperation is aimed at reducing human trafficking and illegal migration in the Aegean Sea. Also, the EU and NATO closely coordinate their positions toward Russia in connection with the illegal annexation of Crimea as the EU imposed economic sanctions while the Alliance strengthened collective defence to a maximum since the days of Cold War. The EU and NATO coordinate support for their eastern and southern partners. 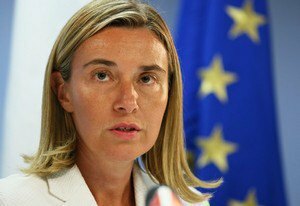 Since February, NATO and the EU signed two formal agreements, reminded Mogherini. One of them concerns the cooperation in cyber defence, the other outlined the practical cooperation in the Aegean Sea. "I think it shows a progress in EU-NATO cooperation. This is an important new initiative. We can and should do more," said the head of European diplomacy. Mogherini also noted that in late June, the European Council will discuss its new strategic security policy that will be followed by a joint statement by the NATO-EU relations. The document will outline key areas of expansion of the Alliance's cooperation with the bloc of European countries. "First of all we will focus on joint fight against cyber and hybrid threats, the support of our partners to increase their defence capabilities, and strengthening the security at sea," Mogherini said. Mogerini said the EU should be more involved in NATO exercises, and vice versa. The head of EU diplomacy recalled that 22 EU countries are members of NATO, "and it is more than 450 million citizens". "We [the EU and NATO] must take our cooperation to a higher level, and that's exactly what we're currently working on," concluded Mogherini. Earlier, Mogherini said that the EU has no plans to strengthen anti-Russian sanctions.